Hopefully we don't have to wait until the 10th of September to see the Ferrari 458 Speciale for real on its world debut at the Frankfurt Motor Show. 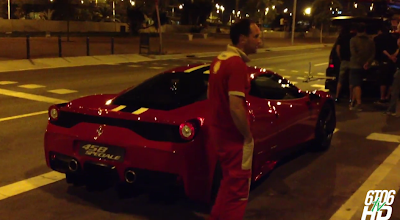 The latest creation of Maranello has been spotted at night in the streets of Barcelona during the making of an official video for Ferrari. The Ferrari 458 Speciale is the most extreme road-going version of the 458 and follows the example of the previous models such as the 430 Scuderia and 360 Challenge Stradale. Compared to a standard 458 Italia, the Speciale is 90kg lighter (with a curb weight of 1290kg), mean while the 4.5L V8 engines gets an extra 30hp with a maximum power of 600hp. What is the price in us $? Nitro fuel is roughly 20% oil, and that oil will mist out through the exhaust and it WILL get everywhere. Cleaning and mantaining the helicopter will become a chore, but if you’re really into your hobby, it won’t be. This is subjective from person to person. I for one HATE cleaning. The placement of the fuel tank and how it will affect the center of gravity becomes important. A little bit of forethought and planning will be needed. The Ferrari 458 Speciale is beautiful,especially in the evening under the neon,I love it!Plus,I am also a huge fun of the remote control car.It is small ,elegant,fabulous,easy to controland so on!Most important of all ,it is my favorite toy because it always brings me so much fun,especially on the weekend!Do you wanna have a try?